We have been making great strides forward on building the next generation wide area network architecture for video surveillance. 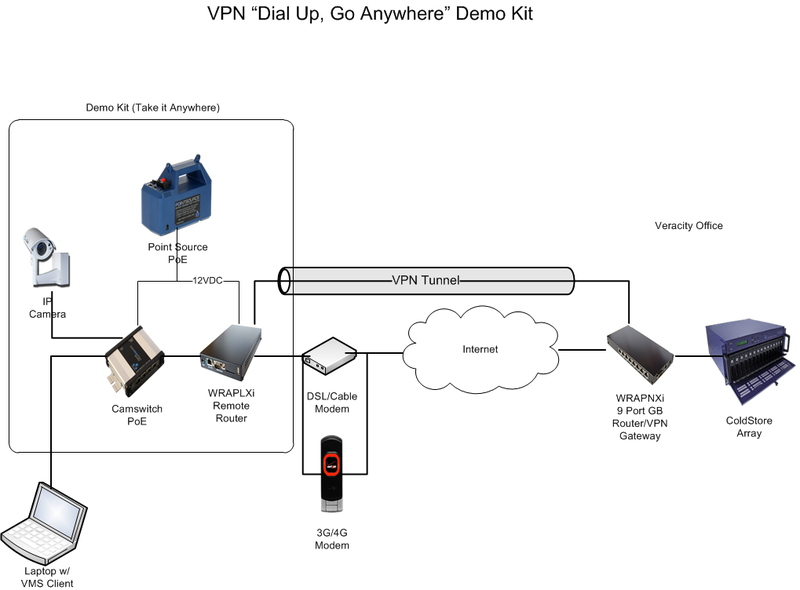 In my last post I explained how we were using a point to point VPN connection to link the Network Optix office in Burbank to the HauteSpot office in Los Osos over standard broadband Internet connections using our HauteWRAP routers. This link has been up and running for three weeks now with no issues. It supports layer 2 network discovery of cameras, multicast broadcasting (completely filterable and route-able using PIM and IGMP). Over the last week we have expanded this capability to include plug and play point to multipoint VPN connections to support Veracity, IQInvision and Network Optix field demonstrations of the Trinity "serverless" VMS system. 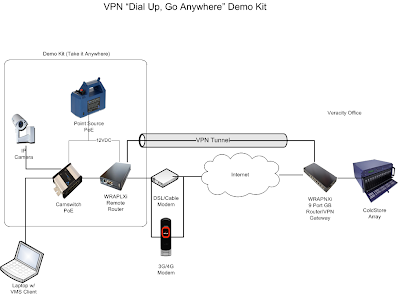 Using our WRAPNXi VPN router/Gateway at the Veracity headquarters and WRAPLXi client routers in demo kits, sales staff can now take the Veracity office demo network on the road with them. The WRAPNXi (data sheet is coming soon) is a 9 port gigabit Ethernet router that supports same complete feature set of all HauteSpot routers including layer 2 bridging, VPN gateway, BGP, RIP, OSPF, and mesh routing, firewall, QoS management, full diagnostics, and more. Setting this up for "dial in" layer 2 VPN was easy. User accounts can be stored on the router or on a RADIUS server, so you can scale up by simply adding more routers. The WRAPNXi can also support 2x2 or 3x3 multi-band MIMO wireless. The WRAPLXi is a compact, single 10/100 Ethernet and 2x2 multiband MIMO wireless router. It acts as a client router that can sit behind a broadband firewall router, automatically configure itself, and automatically establish a VPN connection to the WRAPNXi gateway. It then shares the VPN connection to any devices attached to it. To the devices attached to it, the remote network appears local. Veracity is using this network to connect cameras and PCs at customer sites with their demonstration network. 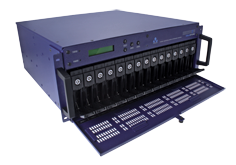 At their main office they have a Veracity ColdStore Network Attached Storage device and a couple of IP cameras. In a field demo kit they have a HauteSpot WRAPLXi, a Veracity Camswitch Quad, an IP Camera, and an optional Veracity PointSource power supply. Connections are fully secured using AES256 encryption and SHA-1 certificated authentication. The WRAPLXi units automatically establish the connection and can be configured for both wireless or wired client operation. As far as the cameras are concerned, they see the local network at the Veracity headquarters and can stream their video to the ColdStore NAS as if they are in the office. Sales staff use the Trinity VSE client software to view live video from cameras both at the customer site and back at the Veracity office. They can also attach to the ColdStore NAS and scroll forward and back along a time line, moving from live viewing directly from the camera to stored video from the ColdStore. This is an incredibly strong sales tool. But more important, it can be an incredible infrastructure for deploying Video Surveillance as a Service. Using the HauteSpot VPN architecture, you can securely connect remote locations over the Internet, quickly, easily, and cost effectively. Maybe we should call this "Virtual Networking as a Service" or "Networking on Demand"